Check out this gently-used 2016 Mercedes-Benz E-Class we recently got in. This CERTIFIED Mercedes-Benz includes: WHEEL LOCKS (PIO) BLACK ROOF LINER PREMIUM PACKAGE STEEL GREY METALLIC COMFORT BOX (PIO) BURL WALNUT WOOD TRIM REARVIEW CAMERA Back-Up Camera REAR SPOILER (PIO) HEATED FRONT SEATS Heated Front Seat(s) Bucket Seats *Note - For third party subscriptions or services, please contact the dealer for more information. * Your buying risks are reduced thanks to a CARFAX BuyBack Guarantee. Why does this vehicle look so great? The CARFAX report shows it's only been owned by one owner. Very few vehicles meet the exacting standards of Certified Pre-Owned status. This Mercedes-Benz E-Class E 350 Luxury has met those standards. There's a level of quality and refinement in this Mercedes-Benz E-Class that you won't find in your average vehicle. Exceptional in every sense of the word, this incredibly low mileage vehicle is one of a kind. 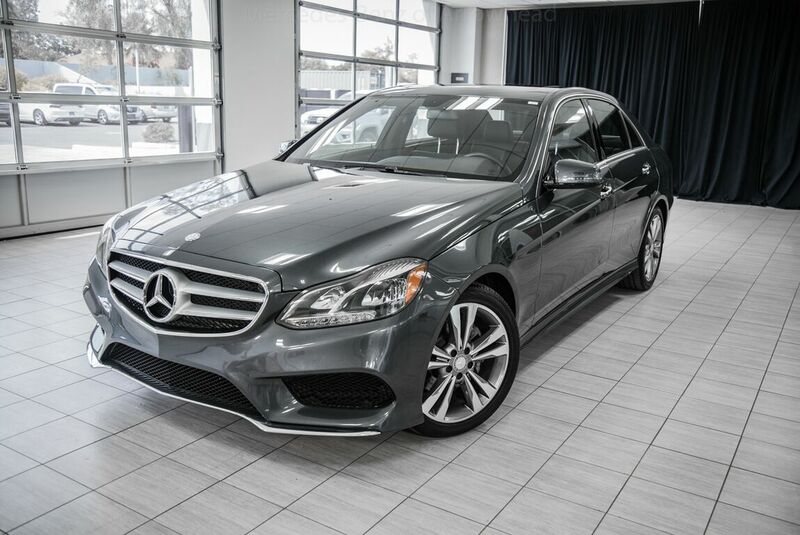 Drive away in this amazing Mercedes-Benz E-Class and enjoy the realization of having the manufacturer's factory warranty coverage still in effect. This Mercedes-Benz E-Class E 350 Luxury comes standard with features that are essential in the 21st Century. However, Mercedes-Benz decided to take it one step further and add a handful of quintessential options that will undoubtedly add to this vehicle's quality and value. Take the guesswork out of where you are going with the top-tier navigation system found on this exceptional Mercedes-Benz E-Class. The upgraded wheels on this vehicle offer improved handling and an attractive appearance. More information about the 2016 Mercedes-Benz E-Class: The E-Class offers a wide range of models that are each quite different, yet they each have plush cabins, some of the world's best safety innovations, and a reputation like no other. All of the E-Class models also have great ride quality and a relatively quiet interior -- even the Cabriolet. The E63 AMG S packs an intense level of performance in an otherwise somewhat staid luxury package. There's also an economical powertrain in the E250 Blue TEC diesel. Interesting features of this model are world-class safety features, Distinguished, luxury-car look, high-performance AMG E63 S, quiet, smooth ride, available clean-diesel model, and elegant interior Visit your Mercedes dealer today serving Phoenix, North Scottsdale, Tempe, Gilbert, Mesa, Chandler, Scottsdale AZ.